SONAR lets you define a snap grid that makes it easier to arrange clips and note events, select time ranges, and control envelope shape drawing. 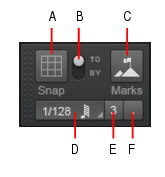 To use the snap grid, enable the Snap to Grid button in the Snap module and set the grid resolution to an interval of musical time, such as a whole note, half note, or quarter note; a unit of absolute time: a number of frames, seconds or samples; an event; the start or end of a clip; a marker; or audio transients. The grid can use multiple resolutions at the same time, such as a whole note, and audio transients. When the Snap to Grid button is enabled, if you move or paste clips or markers, items will be snapped to the nearest point on the snap grid. Figure 231. Snap module sizes. Figure 232. Snap to Grid settings are available in the Snap module in the Control Bar. Snap enable/disable . Enable/disable snapping. Time resolution. Snap to the selected musical or absolute time resolution. Click and hold the mouse button pressed to select a different duration from the pop-up menu. For absolute time resolutions (samples, frames, seconds), type the desired number of units. When Smart Grid is selected (the Snap to Grid button changes to ), the snap resolution is dynamically determined by the horizontal zoom level, and the M:B:T Time Rulers in the Clips pane and Piano Roll view are optimized to show relevant snap locations. Note 1: To exit Smart Grid mode, clear the Smart Grid check mark. If you manually select a new resolution while Smart Grid is enabled, the new settings only apply until the focused view's zoom level changes. Note 2: The Piano Roll view can use its own independent snap resolution. For details, see Piano Roll view snap resolution. Triplet . Reduces the duration of the selected Musical time resolution by 2/3 of its original duration. When Triplet is enabled, three note events fit in the space of two. Dotted . Increase the duration of the selected Musical time resolution by half of its original value (150%). Snap To. Align data to the snap grid. Snap By. Move data by the grid resolution. Landmark Events . Snap to the selected landmarks, including markers, Now Time, clips, audio transients, MIDI notes, and automation envelope nodes. To select the desired landmarks, right-click the Snap to Grid button to open the Preferences dialog, then select the desired check boxes in the Landmarks section. SONAR will snap to landmarks on tracks/lanes that are currently visible in the Clips pane. 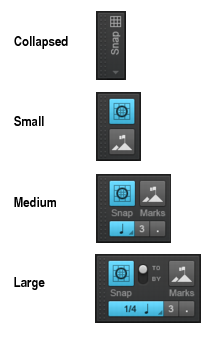 To access additional snap settings, go to Edit > Preferences > Customization - Snap to Grid (or right-click the Snap to Grid button ). Snap Intensity. Specify the magnetic strength when snapping, which determines how quickly moved events are pulled towards the snap grid. Magnetic Test. Drag the event to test the current Snap Intensity setting. Snap to Nearest Audio Zero Crossings. Automatically snap edited audio clips to the nearest zero crossing of the waveform (the point at which there is no volume) to minimize glitches that can happen when waveforms are spliced together. Markers. Snap to any marker. Now Time. Snap to the current Now Time. Clips. Snap to the start or end of any clip. Audio Transients. Snap to transient markers in audio clips. MIDI Notes. Snap to note events in MIDI clips. Automation Nodes. Snap to automation envelope nodes.